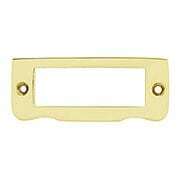 Our 3-Inch Plain Brass Label Holder is a simple, yet stylish way to label the contents of your cabinets and drawers. Easily mounted with the included slotted screws, they're useful throughout your home and office. Choose from an array of classic finish options. 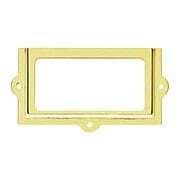 Our solid brass card holder is a simple, yet stylish way to label the contents of your cabinets and drawers. Easily mounted with the included slotted screws, they're useful throughout your home and office. Hand-finished with our "living" antique patina. This old-fashioned 3 1/8-Inch Label Holder features a rolled finger grip. It is designed for very lightweight drawers (the grip is rather slight), like those found in roll-top desks, tool cabinets or crafting stations. Crafted from stamped sheet brass, its hand-applied antique finish continues to age gracefully over time, developing highlights with use. This old-fashioned 2 5/8-Inch Label Holder features a rolled finger grip. It is designed for very lightweight drawers (the grip is rather slight), like those found in roll-top desks, tool cabinets or crafting stations. Crafted from stamped sheet brass, its hand-applied antique finish continues to age gracefully over time, developing highlights with use. 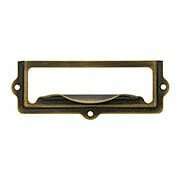 At only 1" high, this cast brass label holder is perfectly sized for small drawers. 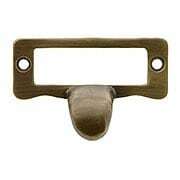 The circa 1900 design features a hook-style finger pull, making it doubly useful in your kitchen or office. Choose from 4 classic finishes! 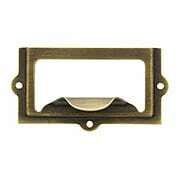 At only 1" high, this cast brass label holder is perfectly sized for small drawers. 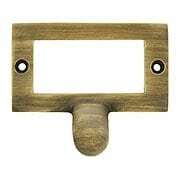 The circa 1900 design features a hook-style finger pull, making it doubly useful in your kitchen or office. Hand-finished with our "living" antique patina. This distinctive label holder & bin pull was inspired by hardware found in Victorian era butler's pantries. Both useful and nostalgic, its a great choice for today's homes as well. Crafted from stamped sheet brass with a lacquered finish. This distinctive label holder & bin pull was inspired by hardware found in Victorian era butler's pantries. Both useful and nostalgic, its a great choice for today's homes as well. 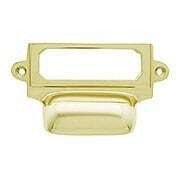 Crafted from solid cast brass with a choice of 6 popular finishes. 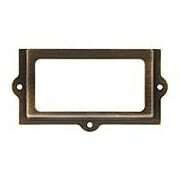 Our vintage-style 2 3/8-Inch Label Holder doubles as a pull, making it useful throughout your home or office. 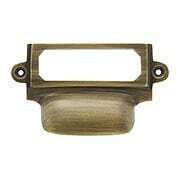 Made of heavy, cast brass with a comfortable finger grip, it is strong enough for kitchen or desk drawers. This vintage style label holder doubles as a pull, making it useful throughout your home or office. 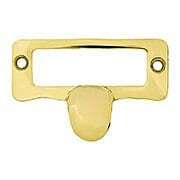 Made of heavy cast brass with a comfortable finger grip, it's strong enough for kitchen or desk drawers. Hand finished with our exclusive antique patina. 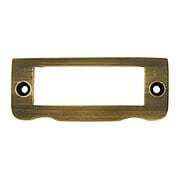 At only 1-inch in height, our Small Cast-Brass Label Holder is perfectly sized for smaller drawers. 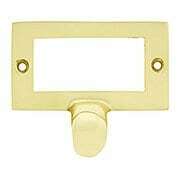 Easily mounted with the included slotted screws, it is useful throughout your home and office. 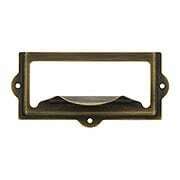 At only 1" high, this cast brass label holder is perfectly sized for small drawers. Easily mounted with the included slotted screws, they're useful throughout your home and office. Hand finished with our exclusive antique patina. 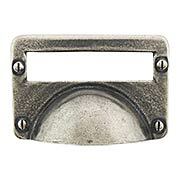 This heavy-duty label holder is the type found on old-fashioned wooden file cabinets. Once relegated to offices, they're now a handy way to label drawers, storage bins, or cabinets throughout your home. 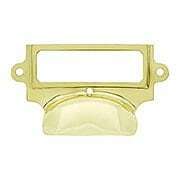 Reproduced in cast brass with a choice of 6 finishes. 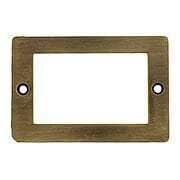 Brass Label Holder In Antique-By-Hand - 3 5/16"
This heavy-duty Brass Label Holder (3 5/16-Inch) is the type found on old-fashioned wooden file cabinets. Once relegated to offices, they are now a handy way to label drawers, storage bins, or cabinets throughout your home. Cast in solid brass and hand-finished with our exclusive antique patina. This distinctive label holder & bin pull was inspired by hardware found in Victorian era butler's pantries. Both useful and nostalgic, its a great choice for today's homes as well. Crafted from solid cast brass and hand finished with our exclusive antique patina. 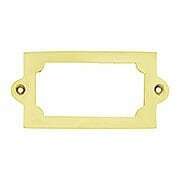 This old-fashioned 3 1/8-Inch Label Holder in Antique-By-Hand features a rolled finger grip. It is designed for very lightweight drawers (the grip is rather slight), like those found in roll-top desks, tool cabinets or crafting stations. Crafted from stamped sheet brass, its hand-applied antique finish continues to age gracefully over time, developing highlights with use. Featuring a rolled finger grip, our old-fashioned 3 1/2-Inch Label Holder doubles as a drawer pull (best suited for lightweight drawers). 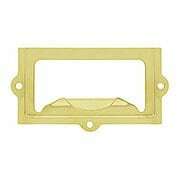 Crafted from stamped, sheet brass, it is an economical way to organize your home and office. It comes in our exclusive Antique by-Hand - a finish that ages gracefully over time into a beautiful natural patina. 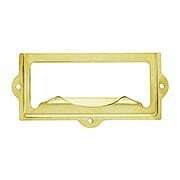 At 1 1/4" high, this stamped-brass label holder is perfectly sized for small drawers. Easily mounted with the included slotted screws, they're useful throughout your home and office. Available in four popular finishes. Our Alden Bin Pull (1 1/4-Inch Center-to-Center) lends traditional style to cabinets and drawers alike. Crafted in England, its pewter finish gracefully ages over time into a beautiful natural patina. If preferred, the original luster can be restored by cleaning with a soft, damp cloth lightly dabbed with silverware polish. Due to the predominantly handmade nature of this collection, subtle differences may appear in each piece.